South Korea's military said Monday it will soon pull back all high-decibel loudspeakers installed along the border with North Korea in its first step to implement the bilateral summit agreement reached last week. The Ministry of National Defense said it will begin the work to remove the equipment from the Demilitarized Zone on Tuesday. In their talks last Friday, President Moon Jae-in and the North's leader Kim Jong-un agreed to "completely cease all hostile acts against each other in every domain." The two leaders added that the two sides will cease all hostile acts and eliminate their means, including broadcasting through loudspeakers and distribution of leaflets, in the areas along the Military Demarcation Line. The South already stopped blaring anti-Pyongyang broadcasts over the border ahead of the Moon-Kim summit. The North has also reportedly suspended its own propaganda broadcasts. Choi Hyun-soo, the ministry's spokesperson, pointed out that the removal of the loudspeakers is a "rudimentary" step that can be done easily in order to build military trust between the two sides. She told reporters that the South's defense authorities have not had separate consultations on the latest measure. 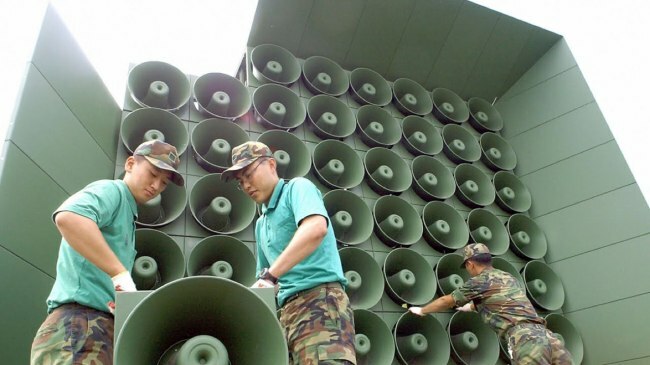 Choi would not confirm the number of loudspeakers in place along the border amid news reports that there are dozens of sets, both fixed and mobile. She was cautious about saying anything on the sensitive issue of the Yellow Sea border at the press briefing. The Panmunjom Declaration calls for turning the tense waters around the Northern Limit Line in the sea west of the peninsula into a maritime peace zone. The area has been the scene of naval skirmishes between the two countries in the past. It's remarkable that the term NLL was used in the official inter-Korean document. The North has long refused to acknowledge the NLL as the sea border, claiming it should be drawn further south. Defining the western sea border is key to turning the waters into a real peace zone. Asked if the NLL stipulated in the declaration reflects Seoul's view, Choi said it requires "additional confirmation" via military talks with the North.